Is black henna safe? NO! Henna is not black! Natural unadulterated henna is not black, it’s a red/brown color. 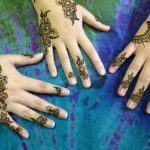 This can be confusing because most pictures we see of henna are pictures of the henna paste on the skin and the paste looks black as it dries. 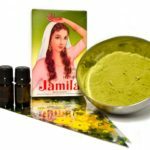 Henna paste is a khaki green or brownish color when wet, but turns black as it dries on the skin. That paste is then removed to reveal an orange stain. This orange henna stain darkens up to a red/brown color over a few days, as in the picture below. Henna stains slightly differently on different people, different skin tones, and different parts of the body. For example, the palms of the hands and the soles of the feet can stain super dark; almost a black color. Even at it’s darkest, you can still see the red tone of natural henna. You can only get this dark of color on those areas. The further away from the hands and feet you go, the lighter the henna stain. Henna is a transparent color so it uses the color of your skin as it’s base. On pale skin, henna trends more brown and on darker skin it trends more maroon or burgundy. This can make it seem like henna is available in various color, but it’s all the same henna, it just looks differently under different conditions. 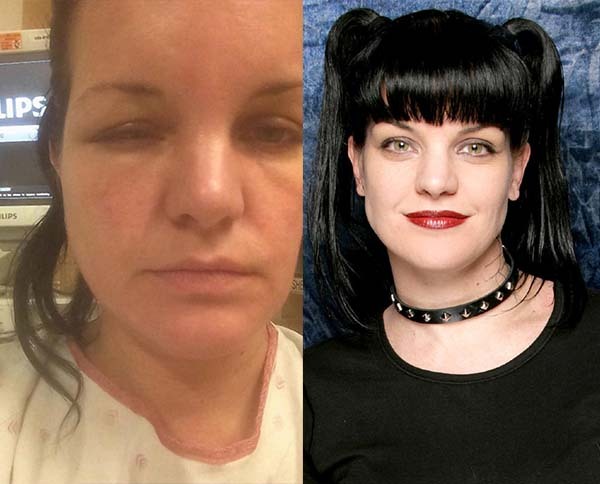 After becoming sensitized to PPD, something as simple as dying yoru hair can land you in the hospital like Pauley Perrette. Now that you understand what natural henna looks like, let’s talk about the product being called black henna. 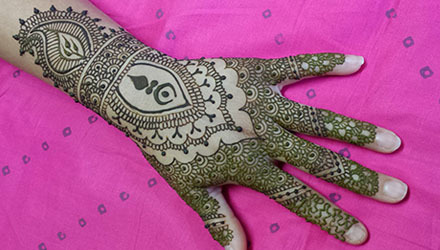 Products marketed as and being called black henna sometimes are not henna at all and other times are henna mixed with paraphenylenediamine (PPD). PPD is a very dangerous chemical and should NEVER be used on the skin. PPD is the chemical in hair dye that is the reason for the warnings plastered on hair dye boxes, and is the cause of hair dye allergies. PPD is legal for use in hair dye in qualities of 6% or less. When used to create black henna, it’s generally in concentrations of 20-70%! Take a moment to think about that. A box of hair dye contains less than 6% PPD, and is covered with warnings about “do a patch test every time you color your hair” and “do not apply hair dye directly to the skin.” Hair dye in generally supposed to sit on the hair for 15-30 minutes. 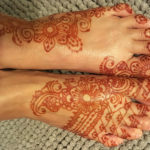 When using for henna, PPD is in concentrations of 20-70%, applied directly to the skin, AND sits on the skin for hours! Aside from being a carcinogen (cancer causing and spreading agent), the big danger with PPD is it enters your bloodstream but the liver cannot process it. This means every exposure to PPD is with you forever. Even if you don’t see physical damage such as blisters or scarring, PPD is still causing damage to your internal organs (both the liver and the kidneys are most directly effected). PPD is legal in the use in hair dyes of 6% or less. PPD is banned in many European countries including France, Germany, and Sweden for use,even, in hair dye. There are natural products that can produce a black or near black stain. Jagua is a plant from South America that when made into a gel can be used to produce a blue-black stain on the skin. Jagua should be avoided if you have allergies to any berries. It’s also rather finicky about heat and can cause minor to severe burning if instructions are not carefully followed. Pure jagua juice can be combined with henna (this is generally called henuga) to produce different shades of brown and brown/black. 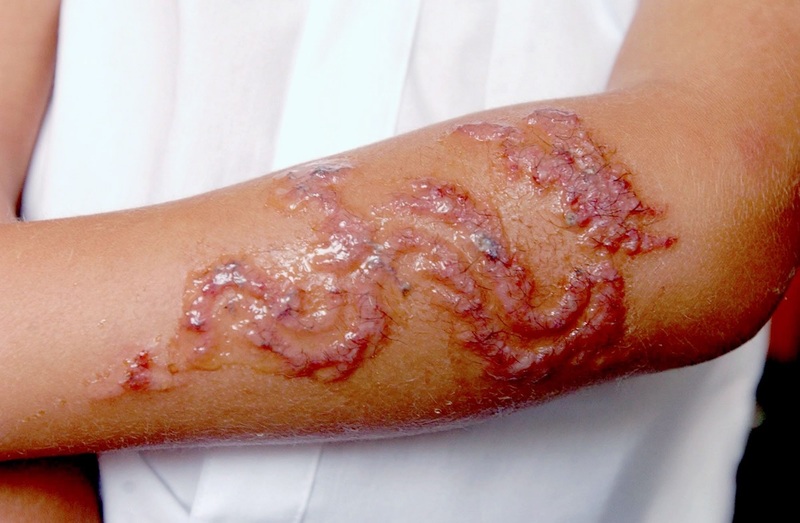 If you choose to use jagua, it’s important to be sure you are getting actual jagua rather than a PPD-based product. Jaugua and jagua juice cost substantially more than henna and cost waaaaaay more than PPD based products. Much like henna, just because something is called jagua, doesn’t mean it is jagua.